Just so you know, I’m intending to broadcast as full a coverage as I can with the knowledge I possess about the current situation with the UQU elections. I was intending to run as the Vice President – Gender and Sexuality for PULSE, before the PULSE ticket was disqualified of course. This is a busy, exciting time for the history of UQ. We can only hope it has a fairytale ending. 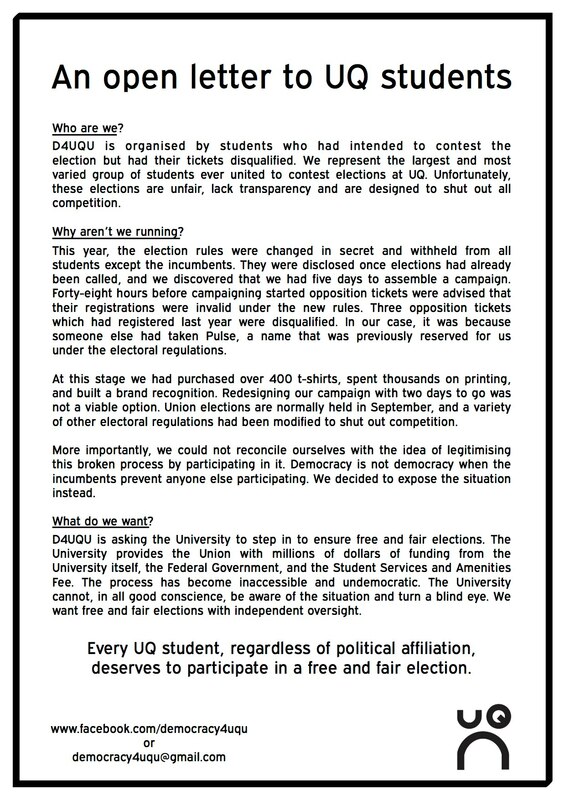 For those unfamiliar with the current UQU scenario, please ‘like’ the Democracy 4 UQU page and also read this article. Stay skeptical of everything you hear over the next two weeks.